This control panel is actually an eavesdropper of all placed orders of a particular symbol. You can manage this process by setting a parameter only by magic number to true. In this case you will enjoy not only watching operation of an EA, a magic number of which you entered in settings, but you will also be able to give a timely response to changes of market trends. Control buttons have specific color which makes them different from other buttons. You can influence on statuses of all kinds of trading orders. Thus you need to click the "+" button to delete all orders having profit or the "-" button to delete unprofitable orders. Click the "ALL" button to delete all orders of a particular type. "TP" and "SL" are designed for managing placement of take profit and stop loss. Enable lines using the "Control Line" button to avoid setting these values to null. Then drag them vertically to a desired level. Disable them to reset values. You can set these values to null by clicking the "TP" or the "SL" button. Trailing Stop is enabled when there is at least one open BUY or SELL order. Settings enable a period and a step. If Control Lines are enabled, the mode of tracking and closing orders will be observed. Otherwise they will be modernized in a regular way. The mode with Control Line can pretty efficiently close your trades. Error messages are translated into English. Added the Trailing Stop function which increased opportunities of the EA. Works in open mode by means of modification of open orders and in hidden mode by levels of the BUY Stop Line, SELL Stop Line. 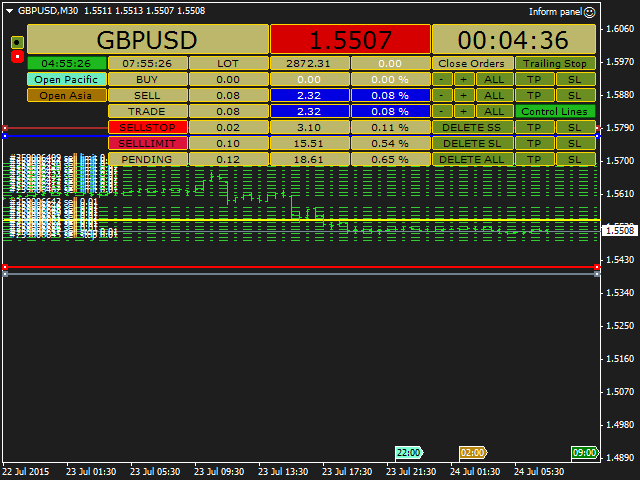 The Trailing Stop button closes trades according to your settings: indent and step. It is now possible to set Take Profits and Stop Losses for pending orders separately for each direction or for all directions simultaneously. Now pending orders can be removed both by their types or simultaneously. Added functions of take profit and stop loss placement for pending orders both for every trading direction and and commonly by levels of control lines. Added display of pending orders' open prices (including the values in deposit percentage) on the data panel. Also, you can now change the colors of the control buttons ('Color work button in the OFF position' setting) visually separating them from the data buttons. 1. The panel can be hidden by pressing the upper left button. Pressing it again makes the panel active. 2. The size of the label of panel movement on the screen has been increased. Click and hold the red button to place the panel in a convenient position. 3. New features of open order management. When button "Control Lines" is pressed and you have selected the levels of "BUY profit line", "SELL profit line", "BUY stop line", "SELL stop line", you can press the appropriate "TP" or "SL" buttons next to trade direction "BUY" or "SELL" to set Take Profit or Stop Loss for the orders at the levels of the appropriate lines with an indent equal to the spread size. 4. When the "Control Lines" button is unpressed, you can press the appropriate "TP" or "SL" buttons next to trade direction "BUY" or "SELL" to reset Take Profit or Stop Loss for the orders to zero.